Portfolios: Why Would a Writer Need One? Lighthouse is offering a new kind of workshop, the 8-Week: Build Your Portfolio. It’s not enough to write anymore; writers have to be organized, presentable, and have a proven track record of clips and samples and the like. After all, there are fellowships, residencies, open submission calls, MFA programs, and a litany of other opportunities to apply for. Those demands and last-minute requests for things like letters of recommendation or writing sample advice are what led Lighthouse program director Andrea Dupree to envisage the Build Your Portfolio workshop. Whether taken solo or in conjunction with the Portfolio Bundle, a more generous helping of craft and instruction, the class will be a one-stop shop for writers looking to get organized and take their collective work to the next level. We caught up with Andrea to discuss her goals for the workshop and what advice she's learned over the course of her own writing career that's informed her organization and motivation. What is a portfolio and why would a writer need one? I always thought of a portfolio as the domain of actors and models and visual artists—you know, those big, leather-bound showpieces that feature photos of people or art, trotted out for interviews and auditions. For writers, it’s typically more of a virtual thing—a collection of writing, for sure, but sometimes, too, thoughts about writing, and credits related to writing. It’s the case you make for your own seriousness, and it can be useful for you if you’re applying for things or if just need to keep yourself on track. You’ll see requests for portfolios for all sorts of applications, for admissions and award committees, for agents, for editors, etc. Sometimes they’ll define what elements make up their request, but in all cases, the writing is probably what matters most. You’ve been to MacDowell twice and got an MFA from Emerson in Boston. How did you approach the application process? For my MFA, I was a mess—totally disorganized, late to the app process, and undisciplined as a writer—but fortunately for me, most programs were not as competitive when I went. Now it’s not unusual for writers to have a trove of publications when they apply to the funded programs, so that’s made the whole business more serious. For MacDowell, I started early enough to get what I hoped would be an excellent letter of rec (thank you, Eli Gottlieb) and focused most on my statement and writing sample. As I said, the writing sample is usually the most important thing, but in some instances the references are just as important, so it makes sense to really dig in early to the application requirements. I’ve learned the most about all of this from being part of various admissions and editorial panels—I’ve reviewed apps for everything from graduate writing programs to fellowship programs to literary magazines. Whenever you’re faced with, say, 400 applicants, you can eliminate probably 300 fairly easily. But when you’re down to the final 100 and then as it narrows further, it’s a matter of the little details and, of course, the subjective take of each of the “deciders.” I wish everyone could be part of a process like that because it would be close to impossible to take it quite so personally when the acceptance isn’t forthcoming. What’s one tip you’d give to people currently applying for writing opportunities? I can think of two things, and they’re both kind of obvious. (But so much that is true is also obvious.) The first is give yourself the gift of time, time to create your art, time to get feedback from people you trust, and time to compile the best case for yourself you can make. It’s scary to try (hence the people who submit to workshop and insist, “I just finished this on my way here”), but it’s important, too, to try. And the second tip might help with this: think of the time you spend not just as a means to an end, but as an investment in your own resolve as a writer. If you consider all the different ways to live a life, the person you really have to convince of your artistic effort is yourself. That it’s worth it. That you can and should spend time making sentences or lines of poetry or made-up stories. If you can convince yourself of that, you’ve already won. More importantly, you can also see that when faced with dozens and dozens of capable manuscripts, certain things stand out: clarity, voice, and in some cases, literary risk. 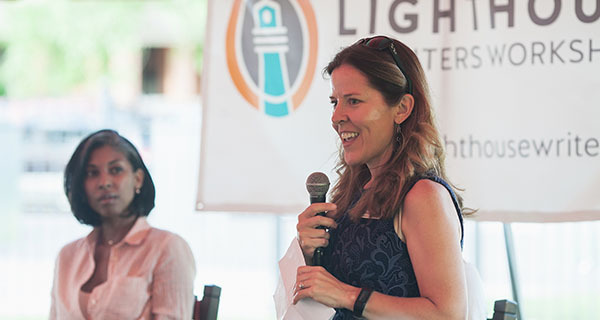 Andrea Dupree serves as the program director for Lighthouse Writers Workshop, which she co-founded in 1997 with Michael J. Henry. Her fiction has appeared in Ploughshares, Virginia Quarterly Review, Colorado Review, Freight Stories, Valparaiso Fiction Review, The Normal School, FiveChapters, Confrontation, and has been listed among distinguished stories in Best American Short Stories. She has received two recent MacDowell Fellowships, which she used to work on a novel. She received her MFA in creative writing at Emerson College in Boston, and her BA in English and Political Science at the University of California, where she graduated Phi Beta Kappa.